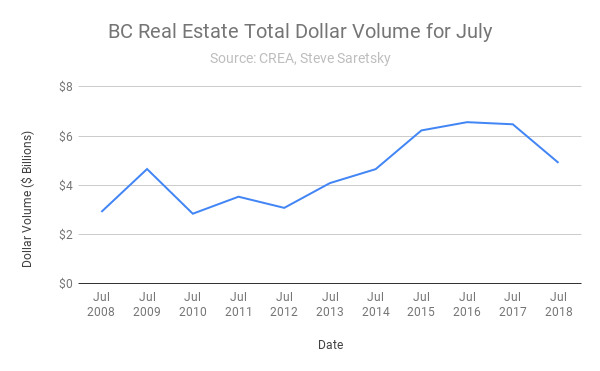 It’s been a tough year for BC real estate, and that trend continued in July. 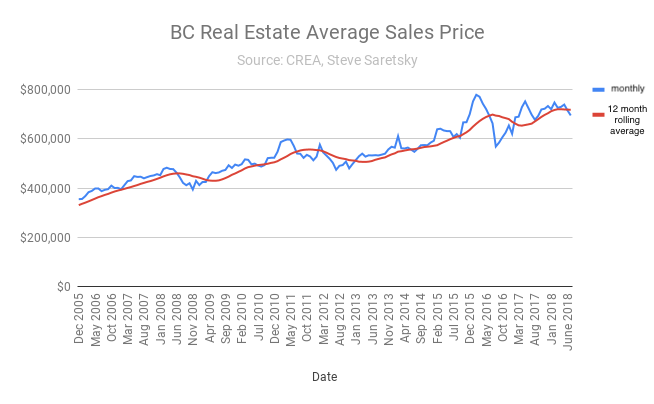 while the decline this month was slightly less dramatic than the month of June, where home sales declined 33%, there’s no signals suggesting the housing market across BC is strengthening. while the BC Real Estate Association noted that “summer home sales slowed to a simmer” the numbers suggest it may be more of a cold bath. Home sales across BC declined 24% year-over-year in July. The 7060 home sales for the month was the lowest total since July 2012 which was considered a weaker year for housing. While Greater Vancouver made up the bulk of the declines, slipping to 29% to an 18 year low for the month, the slowdown was widespread. Home sales in the Okanagan Mainline (Kelowna area) fell 23%, Victoria slipped 19% decline, while the Fraser Valley plunged 34% year-over-year. 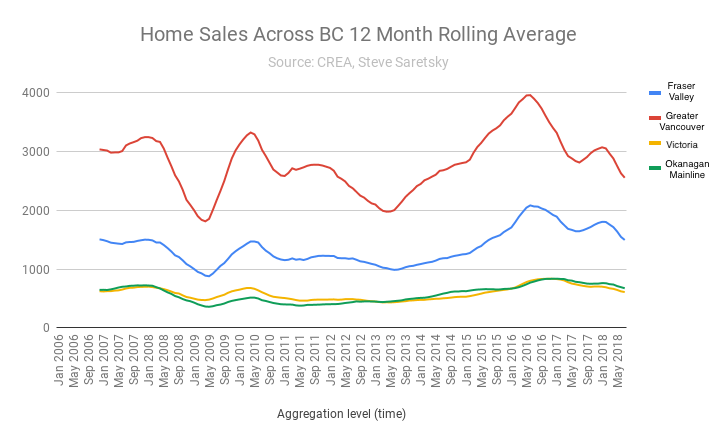 12 month rolling home sales across BC as of July 2018. Dollar volumes, which the government relies on for property transfer tax revenues, also took a hit in July. Volumes slipped 24% year-over-year to 4.9 billion, the lowest total for the month since July 2014. Overall the average sales price across the province remained virtually untouched, slipping just 0.4%. However, it’s safe to suggest peak prices are in the rearview mirror.